Written on 19 June 2017. 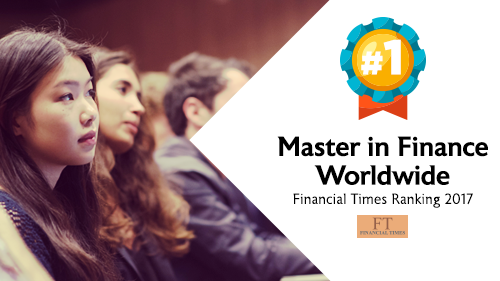 EDHEC Business School’s Master in Finance tops the Financial Times Masters in Finance ranking today. This result underscores EDHEC’s international excellence in finance. After gaining 7 places in 3 years, EDHEC is now ranked as the top business school for finance worldwide by the Financial Times. This ranking vindicates the high-impact strategy initiated several years ago by the School and which has entailed a disruptive policy in the international research field, executed in close proximity to businesses. By producing research that is of true practical use for businesses and is disseminated through the School’s different programmes, EDHEC ensures this strategy has an exceptional impact on the training and placement of its students throughout the world. This top ranking underscores the excellence of EDHEC’s portfolio of programmes and especially the Master of Science in Financial Markets, taught on EDHEC’s Nice campus and commended here today. The dimensions analysed by the Financial Times, particularly via a questionnaire sent to graduates, coincides with the pillars of the programme, namely excellence of tuition and diversity of the student experience, graduate satisfaction & career development and international exposure (“Alumni Career Progress”, “School Diversity” & “International Experience and Reach” in the FT’s terms). “We are very proud to see EDHEC internationally recognised as the world’s top business school for finance. Our original “EDHEC for Business” growth model, founded on academic excellence and close ties with businesses, has proved popular with the market for years, and our graduates are now among the most highly sought-after by financial institutions operating in the world’s leading financial centres”, explains Olivier Oger, Honorary Dean of EDHEC Business School. Since Professor Noël Amenc’s creation of the EDHEC Risk Institute (ERI) in 2001, the School has become an academic reference within the financial industry. This centre of applied research focused on asset management is without equivalent worldwide and has spawned 2 new entities since its inception. The first, EDHEC Infra, is supported by the Monetary Authority of Singapore and has become the leading research team dedicated to infrastructure-project financing and risk assessment. The second, ERI Scientific Beta, based in London, Singapore, Nice, Paris, Boston and Tokyo, is now one of the world’s leading designers and producers of indices offering alternatives to traditional market indices. These 3 entities generate combined annual research revenues in excess of €15 million. They stem from the use of EDHEC’s research models and products by world-leading financial institutions such as Amundi, BlackRock, Goldman Sachs, Merrill Lynch, Morgan Stanley, Nomura and SG. The Scientific Beta indices are used to manage over €15 billion of assets by the world’s largest pension funds and sovereign funds. By promoting and exploiting its research in this way, EDHEC has a positive impact on the largest employers – who are also EDHEC’s clients – and helps create a preference on their part for EDHEC graduates. The result confirms the progress made by EDHEC in all global rankings: the School has gained 11 places in the FT ranking of European Business Schools, 10 places in the FT ranking of Global MBAs worldwide and 7 places in the FT Global Executive Education ranking.